The Shrine of Remembrance in Melbourne runs a programme called “Adopt an Ex Service Association” to facilitate relationships between schools and ex-service organisations in order to carry on each Association’s legacy of service to the nation and the memory of their members. The partnership between school and Association can be based on geographical location or historical connection. In one of our most pleasing developments during 2015, the Bomber Command Commemorative Association Victoria has been adopted by Carey Baptist Grammar School as part of this programme. Ably led by Carey Middle School Chaplain and BCCAV Education Officer Scott Bramley, students from the school participated in the 2015 Bomber Command Commemorative Ceremony at the Shrine. 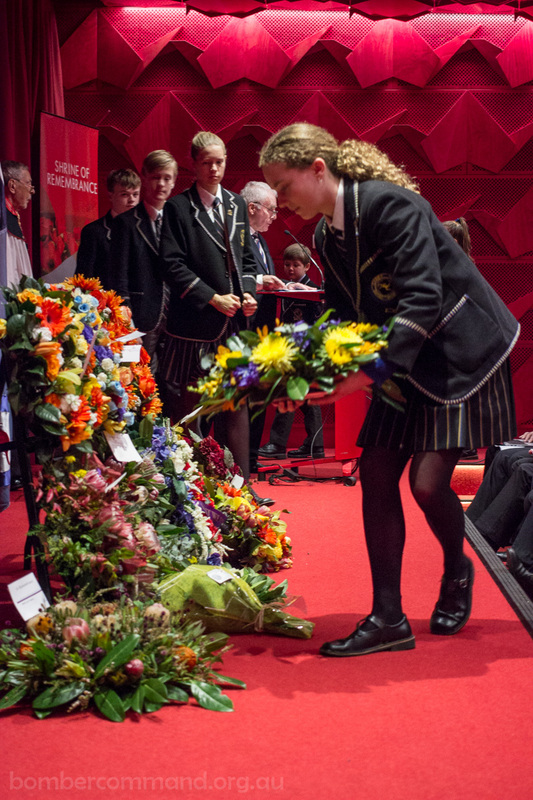 Students from Carey played an active role in the 2016 Melbourne Bomber Command Commemorative Day ceremony held at the Shrine of Remembrance on 5 June. The Ode was read by Carey Middle School Co-Captain Sophie Westcott, and a wreath was laid by the students during the service. Following the formalities the students had an opportunity to meet some of the veterans of Bomber Command who were present.